by Father Alexis U. Floridi, S.J. The history of Holy Ghost Parish begins with the European origins of its founding families. Beginning in the late 1870's and continuing into the early 1900's, immigrants from the old Austro-Hungarian Empire began making their way to America. In the northeastern areas of this dual kingdom, there resided a number of different peoples of Slavic origin. The Austrian region of Galicia contained a concentration of Poles and Ukrainians. Similarly, on the southern slopes of the Carpathian Mountains, in the kingdom of Hungary, lived other Slavic peoples of various backgrounds. The populace of this area went by a variety of national names, however, and terms such as Slavish, Slovak, Hungarian Slav, Ruthenian and Rusyn were used interchangeably. In faith, the Galician Ukrainians and Hungarian Slavs from the Carpathians were Greek Catholic. This term was used to distinguish Catholics of the Byzantine rite in communion with the Pope, from Roman Catholics that resided in the Empire. Although the Catholic Church is unified in terms of faith, there exists within it a diversity in ritual. Thus, the founding families of Holy Ghost Church brought with them their love of their own spiritual heritage. Generally, poverty and the quest for a better life forced large numbers of people to leave Austria-Hungary. The points of departure were many; seaports on the Baltic Sea or coastal cities on the Atlantic Ocean, such as Rotterdam. At that time, passage was by boat, usually in crowded and unsanitary conditions. The trip was long and frightening for most, yet their desire for advancement outweighed the hardships. Upon arriving in cities such as New York, most Ukrainians and Carpathian immigrants headed for the coal mines and steel mills of Pennsylvania. Many also settled in other industrial centers of the Northeast and Midwest. Wherever these people went, they brought with them a desire to establish churches that reflected their spiritual faith. For many reasons, they were usually misunderstood by their fellow Catholics, and it was against great odds that they erected their places of worship. 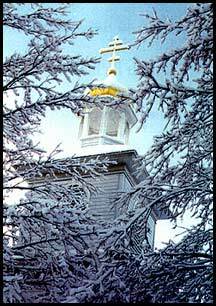 By 1905 there were some 250,000 Ukrainian and Carpathian Byzantine rite Catholics in the United States. In the late 1890's, the first groups of Ukrainian immigrants began to make their way into the Connecticut Valley area of Massachusetts. Many came from established Ukrainian communities in Pennsylvania, New York and New Jersey, and some directly from Ukraine. Unhappy with the work they had found earlier in the mines and mills, many yearned to return to the land as they had done in Europe. Soon, others began to settle, hearing from their friends and relatives of the opportunities that existed in the valley towns. Usually, it was the men that came first, who were then followed by their families. By the early 1900's there was a sizable population of Ukrainians in towns such as Deerfield, Sunderland and Whately, with smaller populations in Hadley, Amherst, Greenfield and Hatfield. Other families, though fewer in number, settled in hill towns such as Conway and Ashfield, and in communities in Southern Vermont and New Hampshire. Likewise, Hungarian Slavs from the Carpathian regions of Hungary also settled in the area towns, though they were fewer in number. Farming became the livelihood for most of these families. Sharecropping was the starting point which, after years of hard work, led to the purchase of the dream, a farm. In sharecropping, a family would rent a piece of land from the owner, who would provide the sharecropper with seed and fertilizer. When the harvest was collected, the tenant would split the profit with the owner. Slowly, these immigrant families saved enough until they could purchase the land. Because of the sizable community of Byzantine rite Catholic Ukrainians and Hungarians, there was, increasingly, the desire to establish a church that reflected their time-honored traditions. Most attended Roman Catholic churches, but deeply missed their own Liturgy. About 1920, through the encouragement of some local Roman rite clergy, an initial meeting was held to discuss the feasibility of starting their own church. A committee was formed which traveled to surrounding communities in hopes of obtaining support for this project. Often a Ukrainian Catholic priest from New York or Connecticut would accompany them to encourage the faithful. Donations were collected from many in the hope of fulfilling their dream. In all, some 60 to 80 families became affiliated with the future parish. While there were many more Byzantine rite Ukrainian families in the area, time and distance took their toll. Some felt comfortable in the churches they had been attending; others were concerned with the problems of travel and expense. The year, 1920 saw the official establishment of the parish. Soon, land on Sugarloaf Street was purchased from Mr. Charles Mosher. On the back of the property, there existed a carriage shed, built in the 1850's of post and beam construction. This was to become the future Holy Ghost Church. After long days at work in the fields, the parishioners would gather to labor at the site of the church. First, the cellar hole was dug, using horses and scoops - and a lot of manual labor. Later, the foundation was built, and then came the task of moving the carriage shed into place. Nightly, the people would gather, slowly, with horses and muscle, moving the building on rollers to the foundation. It took over a week to accomplish this task. In the meantime, services were held, as frequently as possible, at the Redman's Hall in South Deerfield, as the work continued on the church. Since Ukrainian Catholic priests were scarce at this time, especially in rural churches, the founders accepted the services of an Orthodox priest for the first two years. The finishing touches on the church building were being completed. The exterior was stuccoed, and the interior walls were plastered; wainscoting was installed, a choir loft built and a sanctuary constructed. Later, stained glass windows were added, and icons were painted on the walls. Finally, the traditional onion dome and cross were erected on top of the church, and, in 1929, a house was purchased as the rectory for a priest. Wanting to return to their Catholic faith, the parish joined the Ukrainian Catholic Diocese of Philadelphia in 1922 because the majority of parishioners were of Galician-Ukrainian origin. On the otherhand, parishes with Hungarian-Slavic majorities joined the Pittsburgh Ruthenian Catholic Diocese. In later years, both of these dioceses were further divided, so that today there are some 800,000 Ukrainian and Ruthenian Byzantine Rite Catholics in the United States, under the jurisdiction of two archdioceses and five dioceses. Holy Ghost Church became a focal point of the area's Ukrainian community. Fund-raising events, such as dinners and picnics, were held to raise money for the upkeep of the church. Numerous baptisms, marriages and funerals took place in the church, as can be attested by the large number of people in the area who can trace their heritage to the parish. In the early 1950's, a few new families arrived from war-torn Europe and contributed their efforts to the maintaining of the church. In 1971, the community embarked on the project of building a new rectory, which now stands beside the church. The church itself was later enhanced with new siding. Since Vatican II, Eastern Catholic churches throughout the world have been encouraged to return to their traditional, liturgical practices. In recent years, with the spirit of Vatican II in mind, the church community at Holy Ghost decided to have its church reflect its Byzantine-Ukrainian heritage. In the beginning of 1981, a renovation project was initiated, and plans were made to install the traditional iconostas. Along with this, a choir was again formed to lead the congregational singing in both English and Slavonic. 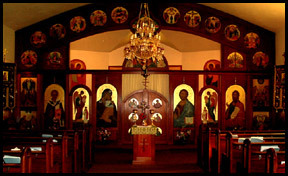 Besides the descendants of the founding families and the later arrivals, Holy Ghost church today reflects people of varied ethnic backgrounds who have been drawn to the church because of its beautiful traditions and, most importantly, the richness of its Eastern spirituality contained in the Divine Liturgy and other liturgical services.